Abstract: Following our earlier research piece on Tether a few weeks ago, further financial information has just been released by Puerto Rico. The new data supports our speculation that Noble Bank could be Tether’s primary reserve bank and that the region may be a major cryptocurrency centre. Over the weekend, the Commissioner of Financial Institutions of Puerto Rico released aggregate financial-system data for the calendar year ended 2017. Bank deposits in the International Financial Entities (IFE) category, which includes Noble Bank, were $3.3 billion, up 248% in the quarter ended December 2017. Total assets in the category were $3.8 billion, up 161% in the quarter. This extraordinary growth coincides with a large increase in value of cryptocurrency assets, which has likely resulted in large cash inflows into cryptocurrency-related banks. Over the same period, the value of Tether in issue has increased by 215% to $1.4 billion. 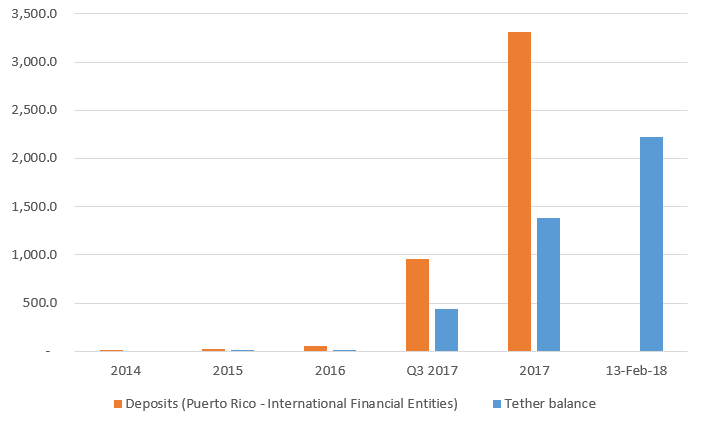 This new data supports the thesis in our recent piece on Tether, in which we speculated that Noble Bank is Tether’s primary reserve bank. We have updated the chart below from the version in our earlier piece, with an initial data point for the end of 2017. 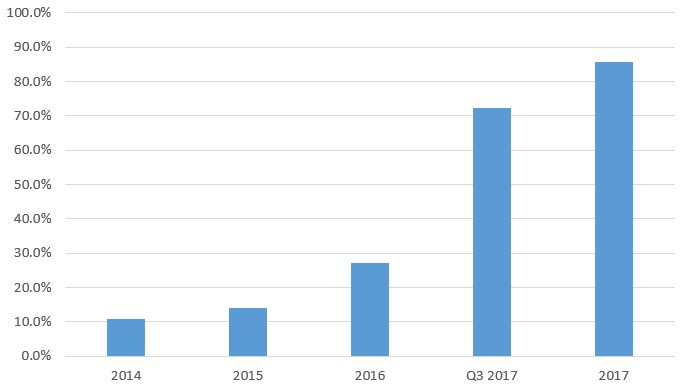 It illustrates the sharp growth in bank deposits in the IFE category in Puerto Rico, coinciding with the recent cryptocurrency boom. Cash as a percentage of total assets (an indication of full-reserve banking) also increased in the quarter, from 72.2% to 85.8%. This also indicates cryptocurrency or Tether-related activity, as we explained in the previous piece. Whilst many claims made in this note are cited, we do not guarantee accuracy. We welcome corrections.